Norway; Norwegian: Norge (Bokmål) or Noreg (Nynorsk), officially the Kingdom of Norway, is a country in Northern Europe occupying the western portion of the Scandinavian Peninsula, as well as Jan Mayen and the Arctic archipelago of Svalbard under the Spitsbergen Treaty. The majority of the country shares a border to the east with Sweden; its northernmost region is bordered by Finland to the south and Russia to the east. The United Kingdom and the Faroe Islands lie to its west across the North Sea, and Denmark lies south of its southern tip across the Skagerrak Strait. Bouvet Island and Peter I Island are dependent territories (Norwegian: biland) of Norway, but not considered part of the Kingdom. Norway also lays claim to a section of Antarctica known as Queen Maud Land, a claim that has been recognised by Australia, France, New Zealand and the United Kingdom. Norway's extensive coastline, facing the North Atlantic Ocean and the Barents Sea, is home to its famous fjords. Inhabited since at least the 10th millennium BC, Norway was unified according to tradition by Harald Fairhair (Harald Hårfagre) in 872 AD after the Battle of Hafrsfjord. The Viking age saw rapid expansion and emigration, Christianity gradually manifesting itself in the 10th and 11th centuries. The country entered into the Kalmar Union with Denmark and Sweden in 1319, remaining under Denmark when Sweden left in 1521. In 1814, Norway was ceded to Sweden following Denmark's alliance with Napoleon, for which Denmark was later penalised. Declaring independence on 7 June 1905, Norway called on a Danish prince to become King Haakon VII; the first king of an independent Norway in 586 years. However, independence only lasted until 9 April 1940, when Norway was occupied by Nazi Germany. After the Second World War, the country has experienced rapid economic growth, particularly as a result of large oil deposits discovered in the early 1970s. Today it ranks amongst the wealthiest countries in the world, with the largest capital reserve per capita of any nation. Norway is the world’s fourth largest oil exporter which accounts for around a quarter of its GDP. Following the ongoing financial crisis of 2007-2009, bankers have deemed the Norwegian krone to be one of the most solid currencies in the world. Norway also has rich resources of gas fields, hydropower, fish, forests, and minerals. The country was the second largest exporter of seafood (in value, after the People’s Republic of China) in 2006. Other main industries include shipping, food processing, shipbuilding, metals, chemicals, mining, fishing and pulp and paper products. Norway maintains a Scandinavian welfare model with universal healthcare, free higher education and a comprehensive social security system. Norway was ranked highest of all countries in human development from 2001 to 2006. It was also rated the most peaceful country in the world in a 2007 survey by Global Peace Index. Although having rejected EU membership at two referendums, Norway maintains close ties with the Union and its member countries, as well as with the USA. It is considered a prominent participant in diplomacy and international development, having been heavily involved with the failed Oslo Accords and negotiated a truce between the Sri Lanka government and the Tamil Tigers. Norway remains one of the biggest financial contributors to the UN, and participates with forces in international missions, notably in Afghanistan, Bosnia and Herzegovina, Kosovo and Sudan. A unitary state with administrative sub-divisions on two levels known as counties (fylker) and municipalities (kommuner), Norway is a constitutional, hereditary monarchy and parliamentary democracy, with King Harald V as its Head of State. It is a founding member of UN, NATO, the Council of Europe and the Nordic Council, and member of EEA, WTO and OECD. The usual Old Norse form of Norway is Noregr and the usual medieval Latin form Nor(th)vegia, though the earliest known written occurrence of the name is English (in the late-ninth-century account of the travels of Ohthere of Hålogaland), in the form norðweg. Although some medieval texts attribute the name to a mythical King Nórr, it is conventionally derived today from Old Norse *norðvegr, meaning ‘the northern route’ (the way northwards). There is, however, some possibility that medieval forms in norð-, north- are folk-etymologisations, and that the name has other origins. The Old Norse and nynorsk forms are quite similar to a Sami word that means ‘along the coast’ or ‘along the sea’ - realized as nuorrek in contemporary Lule Sami. The presence of the archaic prosecutive case marker (sometimes also called prolative in Finno-Ugric language research) supports the claim that the Sami word is indigenous and not a borrowing from North Germanic languages. Either way, competition over the linguistic origins of the name can be seen to reflect cultural tension between Sami ethnic groups and the dominant culture of Norway, which derives its identity from an Old Norse-speaking past. 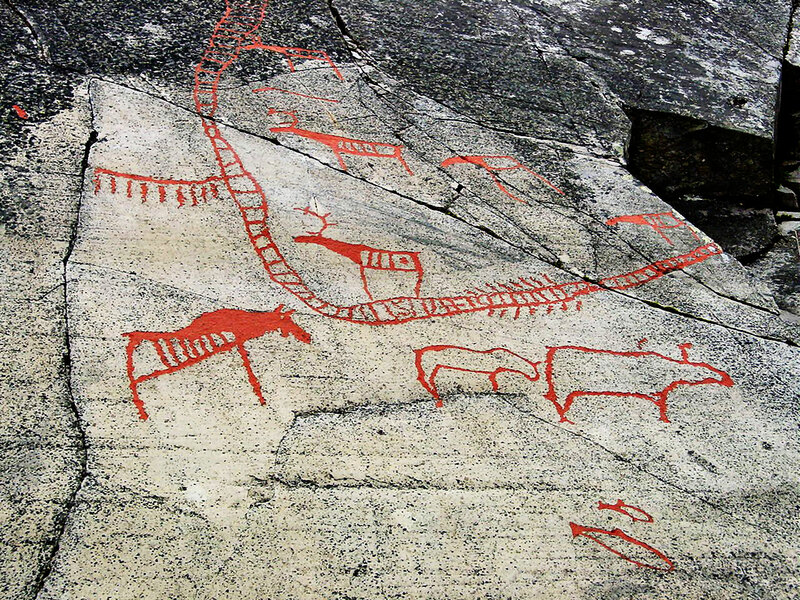 Archaeological findings indicate that Norway was inhabited since at least 10,000 BC. Most historians agree that the core of the populations colonizing Scandinavia came from the present-day Germany. In the first centuries AD, Norway consisted of a number of petty kingdoms. According to tradition, Harald Fairhair (Harald Hårfagre) unified them into one, in 872 AD after the Battle of Hafrsfjord in Stavanger, thus becoming the first king of a united Norway. The Viking age, 8-11th centuries AD, was characterized by expansion and emigration. Many Norwegians left the country to live in Iceland, the Faroe Islands, Greenland and parts of Britain and Ireland. The modern-day Irish cities of Limerick, Dublin, and Waterford were founded by Norwegian settlers. Norse traditions were slowly replaced by Christianity in the 10th and 11th centuries. This is largely attributed to the missionary kings Olav Tryggvasson and St. Olav. Haakon the Good was Norway's first Christian king, in the mid tenth century, though his attempt to introduce the religion was rejected. In 1319, Sweden and Norway were united under King Magnus Eriksson. In 1349, the Black Death killed between 50% and 60% of the population, resulting in a period of decline, both socially and economically. Ostensibly, royal politics at the time resulted in several personal unions between the Nordic countries, eventually bringing the thrones of Norway, Denmark, and Sweden under the control of Queen Margrethe I of Denmark when the country entered into the Kalmar Union. Although Sweden broke out of the union in 1521, Norway remained until 1814, a total of 436 years. During the national romanticism of the 19th century, this period was by some referred to as the ‘400-Year Night’, since all of the kingdom's royal, intellectual, and administrative power was centred in Copenhagen, Denmark. With the introduction of Protestantism in 1536, the archbishopric in Trondheim was dissolved, and the church's incomes were distributed to the court in Copenhagen in Denmark instead. Norway lost the steady stream of pilgrims to the relics of St. Olav at the Nidaros shrine, and with them, much of the contact with cultural and economic life in the rest of Europe. Additionally, Norway saw its land area decrease in the 17th century with the loss of the provinces Båhuslen, Jemtland, and Herjedalen to Sweden, as a result of wars between Denmark–Norway and Sweden. After Denmark–Norway was attacked by Great Britain, it entered into an alliance with Napoleon, with the war leading to dire conditions and mass starvation in 1812. As the Danish kingdom found itself on the losing side in 1814 it was forced to cede Norway to the kingdom of Sweden, while the old Norwegian provinces of Iceland, Greenland and the Faroe Islands remained with the Danish crown. Norway took this opportunity to declare independence, adopted a constitution based on American and French models, and elected the Danish crown prince Christian Fredrik as king on 17 May 1814. This caused the Norwegian-Swedish War to break out between Sweden and Norway but as Sweden's military was not strong enough to defeat the Norwegian forces outright and Norway's treasury was not large enough to support a protracted war, and as British and Russian navies blockaded the Norwegian coast, Norway agreed to enter a personal union with Sweden. Under this arrangement, Norway kept its liberal constitution and independent institutions, except for the foreign service. This period also saw the rise of the Norwegian romantic nationalism, as Norwegians sought to define and express a distinct national character. The movement covered all branches of culture, including literature (Henrik Wergeland, Bjørnstjerne Bjørnson, Peter Christen Asbjørnsen, Jørgen Moe, Henrik Ibsen), painting (Hans Gude, Edvard Munch, Adolph Tidemand), music (Edvard Grieg), and even language policy, where attempts to define a native written language for Norway led to today's two official written forms for Norwegian: Bokmål and Nynorsk. Christian Michelsen, a Norwegian shipping magnate and statesman, Prime Minister of Norway from 1905 to 1907 played a central role in the peaceful separation of Norway from Sweden on 7 June 1905. After a national referendum confirmed the people's preference for a monarchy over a republic, the Norwegian government offered the throne of Norway to the Danish Prince Carl and Parliament unanimously elected him king. He took the name of Haakon VII, after the medieval kings of independent Norway. In 1898, all men were granted universal suffrage, followed by all women in 1913. During World War I, Norway was a neutral country. In reality, however, Norway had been pressured by Great Britain to hand over increasingly large parts of its massive merchant fleet to Britain at low rates, as well as to join the trade blockade against Germany. Norway also claimed neutrality during World War II, but was invaded by German forces on 9 April 1940. Norway was unprepared for the German surprise attack, so military resistance only lasted for two months. The armed forces in the north launched an offensive against the German forces in the Battles of Narvik, until they were forced to surrender on June 10 after losing allied help following the fall of France. King Haakon and the Norwegian government continued the fight from exile in Rotherhithe, London. On the day of the invasion, the collaborative leader of the small National-Socialist party Nasjonal Samling - Vidkun Quisling - tried to seize power, but was forced by the German occupiers to step aside. Real power was wielded by the leader of the German occupation authority, Reichskommissar Josef Terboven. Quisling, as minister president, later formed a collaborationist government under German control. During the five years of Nazi occupation, Norwegians built a resistance movement which fought the German occupation forces with both armed resistance and civil disobedience. More important to the Allied war effort, however, was the role of the Norwegian merchant navy. At the time of the invasion, Norway had the fourth largest merchant marine in the world. It was led by the Norwegian shipping company Nortraship under the Allies throughout the war and took part in every war operation from the evacuation of Dunkirk to the Normandy landings. The war time alliance with Britain and the US was continued in the post war years. Although pursuing the goal of a socialist economy, the Labour Party distanced itself from the communists (especially after Soviet seizure of power in Czechoslovakia in 1948), and strengthened its foreign policy and defence policy ties with the US. Norway received Marshall aid from 1947, joined the OEEC one year later and NATO in 1949. Norway comprises the western part of Scandinavia in Northern Europe. The rugged coastline, broken by huge fjords and thousands of islands, stretches over 2,500 km and over 83,000 km including the fjords and islands. 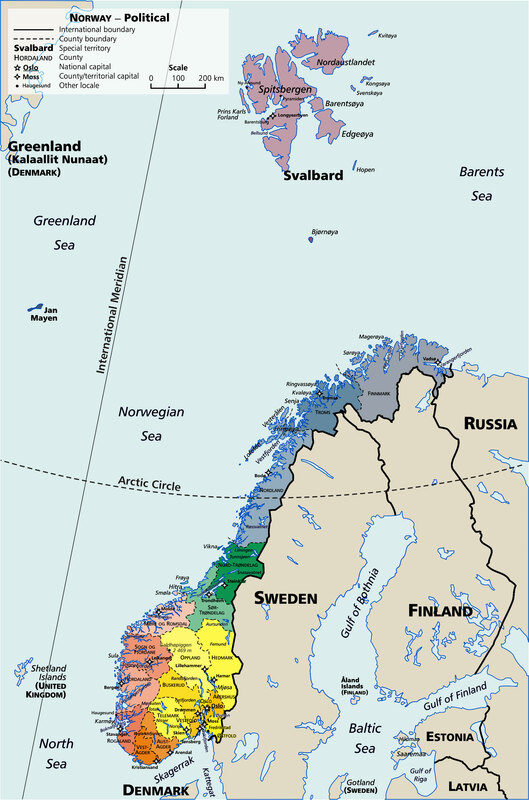 Norway shares a 2,542 km land border with Sweden, Finland, and a short border line to Russia at the east. To the west and south, Norway is bordered by the Norwegian Sea, the North Sea, and Skagerak. The Barents Sea washes on Norway's northern coasts. At 385,252 km² (including Svalbard and Jan Mayen), Norway is slightly larger than Germany, but, unlike Germany, much of the country is dominated by mountainous or high terrain, with a great variety of natural features caused by prehistoric glaciers and varied topography. The most noticeable of these are the fjords: deep grooves cut into the land flooded by the sea following the end of the Ice Age. The longest is Sognefjorden. Norway also contains many glaciers and waterfalls. The land is mostly made of hard granite and gneiss rock, but slate, sandstone and limestone are also common, and the lowest elevations contain marine deposits. Due to the Gulf Stream and prevailing westerlies, Norway experiences warmer temperatures and more precipitation than expected at such northern latitudes, especially along the coast. The mainland experiences four distinct seasons, with colder winters and less precipitation inland. The northernmost part has a mostly maritime Subarctic climate, while Svalbard has an Arctic tundra climate. The southern and western parts of Norway experiences more precipitation, and have milder winters than the south-eastern part. The lowlands around the capital Oslo has the warmest and sunniest summers, but also cold weather and snow in wintertime (especially inland). Average temperatures have risen the last decades, decreasing the amount of days with snow cover in the lowlands. Due to Norway's high latitude, there are large seasonal variations in daylight. From late May to late July, the sun never completely descends beneath the horizon in areas north of the Arctic Circle (hence Norway's description as the ‘Land of the Midnight Sun’) and the rest of the country experiences up to 20 hours of daylight per day. Conversely, from late November to late January, the sun never rises above the horizon in the north, and daylight hours are very short in the rest of the country. Throughout Norway, one will find stunning and dramatic scenery and landscape. The west coast of southern Norway and the coast of North Norway are among the most impressive coastlines anywhere in the world. The 2008 Environmental Performance Index put Norway in second place, after Switzerland, based on the environmental performance of the country's policies. The Constitution of Norway from 1814 was inspired by the United States Declaration of Independence in 1776 and the French revolution in 1789 and subsequent constitutions, and was considered to be one of the most radically democratic constitutions in the world at the time of its adoption. Inspired by Montesqieu’s ideas, the Constitution separates power in three branches of government, the executive, legislative and judiciary. Based on the prevailing ideas during Enlightenment concerning distribution of power, the elected national assembly was only partly supposed to control the government, which was appointed by the King and in turn kept at bay by the independent courts. In 1884, a parliamentary system of government (Norwegian: parlamentarisme) was introduced as customary law, making the Storting the supreme branch of government. In practice, this meant that any government must have sufficient backing in the national assembly, even though executive power is formally vested in the King. However, the Constitution has recently been amended, so today the parliamentary system of government enjoys explicit legal authority. The powers of the national government stem from the Storting, or more accurately, its composition following elections. * Holds audiences with prominent Norwegian figures within politics, industry and commerce and culture. The Norwegian monarchy is unique in the sense that in 1905, when Norway declared its independence, a referendum was held asking the electorate to vote for either a monarchy or a republic. Even though only men were allowed to vote at the time, women also organised petitions. The referendum (and the petitions) resulted with a majority in favour of a monarchy. The Council of State consists of the Prime Minister (the head of government) and other ministers, formally appointed by the King. It is the equivalent of a cabinet. Parliamentarism has evolved since 1884 and entails that the cabinet must not have the parliament against it, and that the appointment by the King is a formality when there is a clear majority in Parliament for a party or a coalition of parties. After elections resulting in no clear majority to any party or coalition, the leader of the party most likely to be able to form a government is appointed Prime Minister by the King. Norway has often been ruled by minority governments. The King has government meetings every Friday at the Royal Palace (Council of State), but the government decisions are decided in advance in government conferences headed by the Prime Minister every Tuesday and Thursday. In order to form a government, more than half the membership of the Council of State is required to belong to the Church of Norway. Currently, this means at least ten out of 19 members. After the negotiations of looser ties between the church and the state, it was decided that this requirement will be abolished in the near future. Nevertheless, only members of the Church of Norway are allowed to discuss matters relating directly to the Church (like the appointment of a bishop) within the Council of State. The Norwegian parliament is the Storting (Stortinget). It currently has 169 members (an increase from 165 effective in the September 2005 elections). The members are elected from the 19 counties for four-year terms according to a system of proportional representation. An additional 19 seats (‘levelling seats’) are allocated on a nationwide basis to make the representation in parliament correspond better with the popular vote. There is a 4 percent election threshold to gain levelling seats. The word Storting means ‘Great Thing’, a thing being an assembly. The Storting is a qualified unicameral body. After elections it elects a quarter of its membership to form the Lagting, a sort of upper house, with the remaining three quarters forming the Odelsting, a lower house. When voting the two chambers divide, and this division of chambers is also used on very rare occasions such as impeachment. The original idea in 1814 was probably to have the Lagting act as an actual upper house, and the senior and more experienced members of the Storting were placed here. Laws are in most cases proposed by the government through a Member of the Council of State, or in some cases by a member of the Odelsting in case of repeated disagreement in the joint Storting. In modern times the Lagting rarely disagrees, effectively rubber-stamping the Odelsting's decisions. Impeachment cases are very rare and may be brought against Members of the Council of State, of the Supreme Court (Høyesterett), or of the Storting for criminal offenses which they may have committed in their official capacity. The last case was in 1927, when Prime Minister Abraham Berge was acquitted. * The abolition of division after the 2009 general election (making the Storting fully unicameral). Legislation will go through two readings, or three in case of dissent, before being passed and sent to the King for assent. * Changes in impeachment procedures. The current system (indictments raised by the Odelsting and judged by the Lagting and the Supreme Court justices as part of the High Court of the Realm) will be replaced by new system (indictments raised by the Storting in plenary session; impeachment cases will be heard by the five highest-ranking Supreme Court justices and six lay members in one of the Supreme Court courtrooms, instead of the Lagting chamber; Storting representatives no longer perform as lay judges). The judiciary is referred to as the Courts of Justice of Norway. It consists of a Supreme Court of 18 permanent judges and a chief justice, appellate courts, city and district courts, and conciliation councils. Judges attached to regular courts are appointed by the king-in-council. Each December Norway gives a Christmas tree to the United Kingdom in thanks for the UK's assistance during World War II. A ceremony takes place to erect the tree in Trafalgar Square. In its 2007 Worldwide Press Freedom Index, Reporters Without Borders ranked Norway at a shared 1st place (with Iceland) out of 169 countries. Norway maintains embassies in 86 countries around the world. 60 countries maintain an embassy in Norway, all of them in the capital, Oslo. Norway is a founding member of the United Nations, NATO and the Council of Europe. The Norwegian electorate has twice rejected treaties of accession to the European Union (EU). Most legislation made by the EU is however implemented in the country due to Norway's membership in the European Economic Area (EEA). This ensures Norway's access to the EU's internal market. See also: Norway and the European Union. The Norwegian Armed Forces currently numbers about 23,000 personnel, including civilian employees. According to the current (as of 2009) mobilization plans, the strength during full mobilization is approximately 83,000 combatant personnel. Norway has mandatory military service for males (6–12 months of training) and voluntary service for females. Because of the effect of the failed neutrality of Norway during World War II and their subsequent surrender to Germany in June 1940, Norway was one of the founding nations of the North Atlantic Treaty Organization (NATO) on 4 April 1949, thus abandoning the neutrality policy first imposed. Norway claims to have never formally surrendered to the German invasion. Their monarchy and some government officials fled to the United Kingdom. Norway is divided into nineteen first-level administrative regions known as fylker (‘counties’, singular fylke) and 430 second-level kommuner (‘municipalities’, singular kommune). The fylke is the intermediate administration between state and municipality. The King is represented in every county by a Fylkesmann. A geopolitical map of Norway, showing the 19 fylker, the Svalbard (Spitsbergen) and Jan Mayen islands, which are part of the Norwegian kingdom. There are 96 settlements with city status in Norway. In most cases, the city borders are coterminous with the borders of their respective municipalities. Often, Norwegian city municipalities include large non-built up areas; for example, Oslo municipality contains large forests, located north and south-east of the city, and over half of Bergen municipality consists of mountaineous areas. The ten largest municipalities with city status in Norway are (as of 1 January 2008): Sandvika in Bærum municipality (population of 108,144 as of 2008) declared itself a city in 2003 (permitted since 1996), but the ‘city border’ of Sandvika is usually not considered to be coterminous with the municipality border. As Sandvika and most of Bærum in general is included in the Oslo urban area, as defined by Statistics Norway, its population is not possible to estimate. Norway also has two integral overseas territories, Jan Mayen and Svalbard. There are also three dependencies in the South Pacific, Bouvet Island, Peter I Island and Queen Maud Land. Norway is among the world leaders in offshore petroleum technology. Norway's oil-capital is Stavanger. Norwegians enjoy the second highest GDP per-capita (after Luxembourg) and third highest GDP (PPP) per-capita in the world. Norway has maintained first place in the world in the UNDP Human Development Index (HDI) for six consecutive years (2001-2006). However, in 2007 Iceland very narrowly beat Norway as the #1 place according to the Human Development Index. The Norwegian economy is an example of a mixed economy, featuring a combination of free market activity and large government ownership. The government has large ownership positions in key industrial sectors, such as the strategic petroleum sector (StatoilHydro), hydroelectric energy production (Statkraft), aluminum production (Norsk Hydro), the largest Norwegian bank (DnB NOR) and telecommunication provider (Telenor). The government controls 31.6% of publicly-listed companies. When non-listed companies are included the state has even higher share in ownership (mainly from direct oil license ownership). Bryggen in Bergen is on the list of UNESCO World Heritage Sites. Referendums in 1972 and 1994 indicated that the Norwegian people wished to remain outside the European Union (EU). However, Norway, together with Iceland and Liechtenstein, participates in the European Union's single market via the European Economic Area (EEA) agreement. The EEA Treaty between the European Union countries and the EFTA countries – transposed into Norwegian law via ‘EØS-loven’ – describes the procedures for implementing European Union rules in Norway and the other EFTA countries. This makes Norway a highly integrated member of most sectors of the EU internal market. However, some sectors, such as agriculture, oil and fish, are not wholly covered by the EEA Treaty. Norway has also acceded to the Schengen Agreement and several other intergovernmental agreements between the EU member states. The country is richly endowed with natural resources including petroleum, hydropower, fish, forests, and minerals. Large reserves of petroleum and natural gas were discovered in the 1960s, which led to a continuing boom in the economy. Norway has obtained one of the highest standards of living in the world in part by having a large amount of natural resources compared to the size of the population. The income from natural resources includes a significant contribution from petroleum production and the substantial and well-managed income related to this sector. Norway also has a very low unemployment rate, currently below 2% (June 2007). The hourly productivity levels, as well as average hourly wages in Norway are among the highest in the world. The egalitarian values of the Norwegian society ensure that the wage difference between the lowest paid worker and the CEO of most companies is much smaller than in comparable western economies. This is also evident in Norway's low Gini coefficient. Cost of living is about 30% higher in Norway than in the United States and 25% higher than the United Kingdom. The standard of living in Norway is high, and oil exports lead to a conclusion that Norway will remain wealthy through the foreseeable future. Export revenues from oil and gas have risen to 45% of total exports and constitute more than 20% of the GDP. Only Russia and OPEC member Saudi Arabia export more oil than Norway, which is not an OPEC member. To reduce over-heating from oil money and the uncertainty from the oil income volatility, and to save money for an aging population, the Norwegian state started in 1995 to save petroleum income (taxes, dividends, licensing, sales) in a sovereign wealth fund (‘Government Pension Fund - Global’). This also reduces the boom and bust cycle associated with raw material production and the marginalization of non-oil industry (see also Dutch Disease). The control mechanisms over petroleum resources are a combination of state ownership in major operators in the Norwegian oil fields (StatoilHydro approx. 62% in 2007) and the fully state-owned Petoro (market value of about twice Statoil) and SDFI. Finally the government controls licensing of exploration and production of fields. The fund invests in developed financial markets outside Norway. The budgetary rule (‘Handlingsregelen’) is to spend no more than 4% of the fund each year (assumed to be the normal yield from the fund ). By January 2006, the Government Pension Fund of Norway fund had reached a value of USD 200 billion. During the first half of 2007, the pension fund became the largest fund in Europe, with assets of about USD 300 billion (equivalent to over USD 62,000 per capita). The savings equal the Norwegian GDP and are the largest capital reserve per capita of any nation as of April 2007. Projections indicate that the Norwegian pension fund may become the largest capital fund in the world. Currently it is the second-largest state-owned sovereign wealth fund, second only to the Abu Dhabi Investment Authority; Conservative estimates tell that the fund may reach USD 800-900 billion by 2017. The future size of the fund is of course closely linked to the price of oil and to developments in international financial markets. At an average oil price of USD 100 per barrel, the trade surplus for 2008 is expected to reach USD 80 billion. At June 2008 oil prices, the trade surplus for 2008 is expected to reach USD 90 billion. In 2000, the government sold one-third of the then 100% state-owned oil company Statoil in an IPO. The next year, the main telecom supplier, Telenor, was listed on Oslo Stock Exchange. The state also owns significant shares of Norway's largest bank, DnB NOR and the airline SAS. Since 2000, economic growth has been rapid, pushing unemployment down to levels not seen since the early 1980s (unemployment: 1.3%). Norway is also the world's second largest exporter of fish (in value, after China). Hydroelectric plants generate roughly 98-99% of Norways electric power. Higher education in Norway is offered by a range of seven universities, five specialised colleges, 25 university colleges as well as a range of private colleges. Education follows the Bologna process involving Bachelor (3 years), Master (2 years) and Doctor (4 years) degrees. Acceptance is offered after finishing upper secondary school with general study competence. Public education is virtually free, with an academic year with two semesters, from August to December and from January to June. The ultimate responsibility for the education lies with the Norwegian Ministry of Education and Research. As of 2009, Norway's population numbered 4.8 million. Most Norwegians are ethnic Norwegians, a North Germanic people. The Sami people traditionally inhabit central and northern parts of Norway and Sweden, as well as in northern Finland and in Russia on the Kola Peninsula. Another national minority are the Kven people who are the descendants of Finnish speaking people that moved to northern Norway in the 18th up to the 20th century. Both the Sami and the Kven were subjected to a strong assimilation policy by the Norwegian government from the 19th century up to the 1970s. Because of this ‘Norwegianisation process’, many families of Sami or Kven ancestry now self-identify as ethnic Norwegian. This, combined with a long history of co-habitation of the Sami and North Germanic peoples on the Scandinavian peninsula, makes claims about ethnic population statistics less straightforward than is often suggested particularly in central and northern Norway. Other groups recognized as national minorities of Norway are Jews, Forest Finns, Roma/Gypsies and Romani people/Travelers. In recent years, immigration has accounted for more than half of Norway's population growth. According to Statistics Norway (SSB), a record 61,200 immigrants arrived in the country in 2007 - 35% higher than 2006. At the beginning of 2008, there were 459,600 persons in Norway with an immigrant background (i.e. immigrants, or born of immigrant parents), comprising 9.7% of the total population. 350,000 of these were from a non-Western background, which includes the formerly Communist countries according to the definition used by Statistics Norway. The largest immigrant groups by country of origin, in order of size, are Poles, Pakistanis, Swedes, Iraqis, Somalis, Vietnamese, Danes, and Germans. Norwegians of Pakistani descent are the largest visible minority group in Norway, with most of its 59,000 members living around Oslo. The Iraqi immigrant population has shown a large increase in recent years. After the enlargement of the EU in 2004, there has also been an influx of immigrants from Central and Eastern Europe, particularly Poland. The largest increase in 2007 was of immigrants from Poland, Germany, Sweden, Lithuania and Russia. In common with other Scandinavian countries, the Norse followed a form of native Germanic paganism known as Norse paganism. By the end of the eleventh century, when Norway had been Christianised, the indigenous Norse religion and practices were prohibited. Anti-heathenry laws, however, were removed early in the twentieth century. Many remnants of the native religion and beliefs of Norway exist today, including names, referential names of cities and locations, the days of the week, and other parts of the everyday language. Nearly 83% of Norwegians are members of the state Church of Norway, to which they are registered at baptism. Many remain in the state church to be able to use services such as baptism, confirmation, marriage and burial, rites which have strong cultural standing in Norway. Up to 40% of the membership attends church or religious meetings during a year, with fewer attending regularly. Other Christian denominations total about 4.5% of the population. These include the Evangelical Lutheran Free Church, the Roman Catholic Church, Pentecostal congregations, the Methodist Church, Adventists, the Church of Jesus Christ of Latter-day Saints, and Jehovah's Witnesses and others. Among non-Christian religions, Islam is the largest, representing about 1.5% of the population: It is practiced mainly by Somali, Arab, Albanian, and Turkish immigrants, as well as Norwegians of Pakistani descent. Other religions comprise less than 1% each, including Judaism (see Jews in Norway). Indian immigrants introduced Hinduism to Norway, but account for fewer than 5,000 people, or 1% of non-Lutheran Norwegians. There are eleven Buddhist organizations, grouped under the Buddhistforbundet organisation, which make up 0.42% of the population. Around 1.5% of Norwegians adhere to the secular Norwegian Humanist Association. About 5% of the population is unaffiliated. The North Germanic Norwegian language has two official written forms, Bokmål and Nynorsk. They have officially equal status, i.e. they are both used in public administration, in schools, churches, radio and television, but Bokmål is used by the vast majority, about 85-90%. Around 95% of the population speak Norwegian as their native tongue, although many speak dialects that may differ significantly from the written language. In general Norwegian dialects are inter-intelligible, though some may require significant effort. Several Finno-Ugric Sami languages are spoken and written throughout the country, especially in the north, by the Sami people. 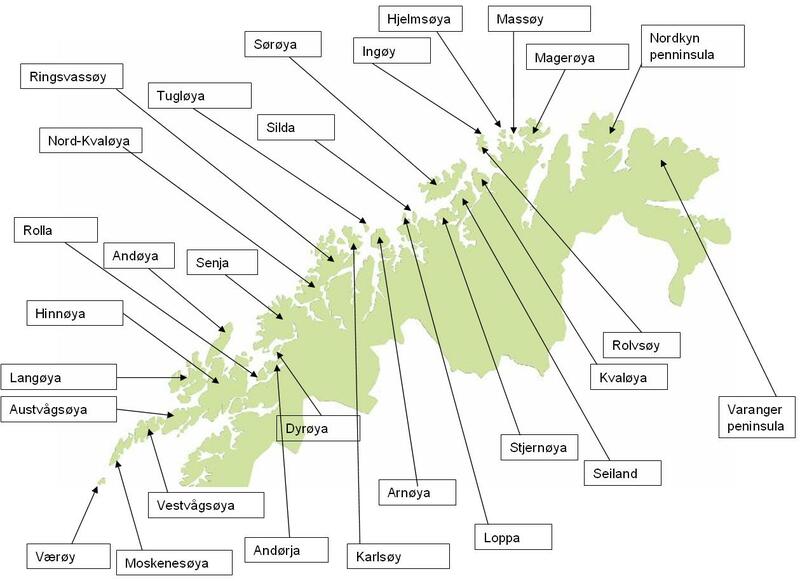 The state recognises these languages as official, and speakers have a right to get education in Sami language no matter where they are living, and receive communications from government in various Sami languages. The Kven minority speak the Finno-Ugric Kven language/Finnish. There is advocacy for making Norwegian Sign Language an official Norwegian language. Norwegian is highly similar to the other languages in Scandinavia, Swedish and Danish. All three languages are mutually intelligible and can be – and commonly are – employed in communication between inhabitants of the Scandinavian countries. As a result of the cooperation within the Nordic Council, inhabitants of all Nordic countries, including Iceland and Finland, have the right to communicate with the Norwegian authorities in their own language. Any Norwegian student who is a child of immigrant parents is encouraged to learn the Norwegian language. The Norwegian government offers language instructional courses for immigrants wishing to obtain Norwegian citizenship. The main foreign language taught in Norwegian elementary school is English. The majority of the population is fluent in English, especially those born after World War II. German, French and Spanish are also commonly taught as a second or, more often, third language. Russian, Japanese, Italian, Latin and rarely Chinese (Mandarin) are available in some schools, mostly in the cities. Little Norwegian literature came out of the period of the Scandinavian Union and the subsequent Dano-Norwegian union (1387—1814), with some notable exceptions such as Petter Dass and Ludvig Holberg. In his play Peer Gynt, Ibsen characterized this period as ‘Twice two hundred years of darkness/brooded o'er the race of monkeys’, although the latter line is not as frequently quoted as the former. During the union with Denmark, written Norwegian was replaced by Danish. By the late 19th century, in the Golden Age of Norwegian literature, the so-called Great Four emerged: Henrik Ibsen, Bjørnstjerne Bjørnson, Alexander Kielland, and Jonas Lie. Bjørnson's ‘peasant novels’, such as ‘En glad gutt’ (A Happy Boy) and ‘Synnøve Solbakken’ are typical of the national romanticism of their day, whereas Kielland's novels and short stories are mostly realistic. Although an important contributor to early Norwegian romanticism (especially the ironic Peer Gynt), Henrik Ibsen's fame rests primarily on his pioneering realistic dramas such The Wild Duck and A Doll's House, many of which caused moral uproar because of their candid portrayals of the middle classes. In the twentieth century, three Norwegian novelists were awarded the Nobel prize in literature: Bjørnstjerne Bjørnson in 1903, Knut Hamsun for the book ‘Markens grøde’ (‘Growth of the Soil’) in 1920, and Sigrid Undset in 1928. In the 20th century writers like Dag Solstad, Jostein Gaarder, Erik Fosnes Hansen, Jens Bjørneboe, Kjartan Fløgstad, Lars Saabye Christensen, Johan Borgen, Herbjørg Wassmo, Jan Erik Vold, Rolf Jacobsen, Olaf Bull, Jan Kjærstad, Georg Johannesen, Tarjei Vesaas, Sigurd Hoel, Arnulf Øverland and Johan Falkberget have made important contributions to Norwegian literature.